Over the past 18 months Systems Power under a contract from Petrofac have developed a design for containerised Harmonic Filters for a UAE oil application as part of the BAB project. This unique design was a first for this type of harmonic filter in the region and represents a further example of the flexible and dynamic “fast prototyping” design skills within the company. The equipment is a series of 33kv harmonic filters designed as part of the network harmonic control system and includes a fuseless capacitor bank design with air cored reactors and grid type resistors. 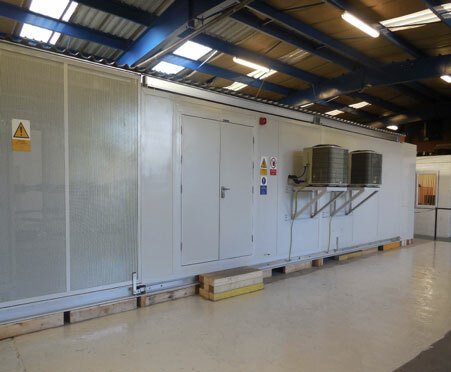 A control and protection panel is included and the equipment is mounted inside a custom build steel container with 6mm thick steel walls and an Aluminium floor. The enclosure was designed and built in sections and then assembled at site and the design incorporates various requirements including Arc Fault pressure withstand in addition to the regular seismic and wind loading calculations. Due to the level of generated heat the enclosure is fitted with a fully automated AC system and a client specified Inergen Gas Fire Control System. The equipment was designed and built in 9 months against exacting design specifications and client requirements. If you would like to receive regular news updates from Systems Power please enter your email address below to subscribe.